The Subversive Archaeologist: You Want the Straight Truth from the Media and Not Myths in the Making? You Got It! You Want the Straight Truth from the Media and Not Myths in the Making? You Got It! I guess it's true that you should always be careful what you wish for. I'm always bangin' on the media for acting as stenographers for scientists with extraordinary claims supported by equivocal evidence. I guess I deserve this. From the SA news ticker comes this headline from CBSNEWS.com [copyright Associated Press]. The whole thing's reproduced below. Have a look. Then help me figger out what's truly newsworthy in this up-to-the-minute bulletin from the Near East. Nothing new in the wooden sarcophaguses, or the human bone. 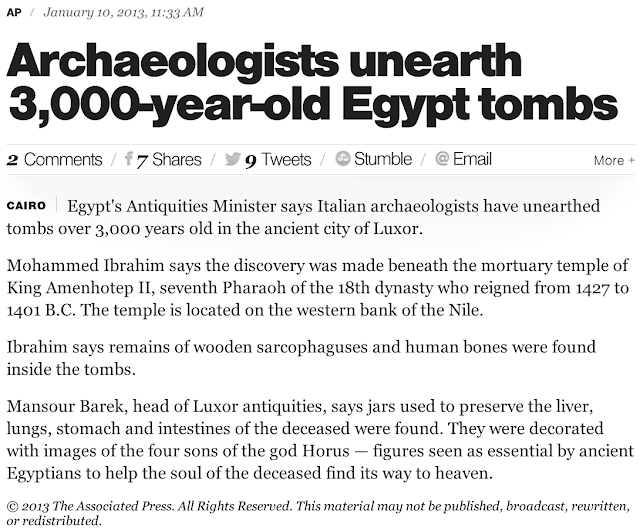 Is it because the archaeologists are Italian? Perhaps it's that a tomb only 3,000 years old was found stratigraphically inferior to a structure that's older--3,413 years old--based on the date given for the end of Amenhotep II's reign [which one must presume was also the date of his life's end]. Details of the embalming ritual and of the ancients' cosmology are already well known. That information couldn't possibily have moved CBS to publish this. Could it? Given the prominence of Egyptology in the public's consciousness, this article has about as much news in it as would a report on the flushing of a few millions toilets at half time during the Super Bowl. Is this what I have to look forward to when the rest of the world finally learns to see things my way? Jeebuz! Maybe I should consider a career change, now, to save myself a case of terminal ennui in that golden future. And The Winner Is... Biface!